A crippling knee injury forced Elliot Mills to trade in his FBI badge for dusty chalkboards and bored college students. Now a history professor at Puget Sound university, the former agent has put his old life behind him—but it seems his old life isn't finished with him. "Surrounded by glistening pine trees, enveloped by rain and fog, for the first time it occurred to Elliot that his extended period of solitude just might be turning to loneliness." I abandoned the Adrien English mysteries after the second book because I tired of Jake’s assholery. 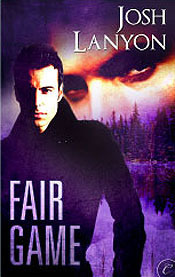 Now that I’ve finished Fair Game in just one sitting, I’m starting to regret that decision. I’d forgotten how good a writer Josh Lanyon is and how much fun it is to read a light mystery with two seemingly incompatible men whose feelings run deep and passionate. Even though I figured out the villain early on, it was still satisfying watch Elliot Mills and Tucker Lance work together to stop more male college students from being killed, hashing out the problems that ended their relationship disastrously, and kissing and making up. I loved this story and can’t wait to read the next two sequels.